Artist impression of the Siemens Charger locomotives that are to power Via Rail Canada's new trainsets. Siemens. 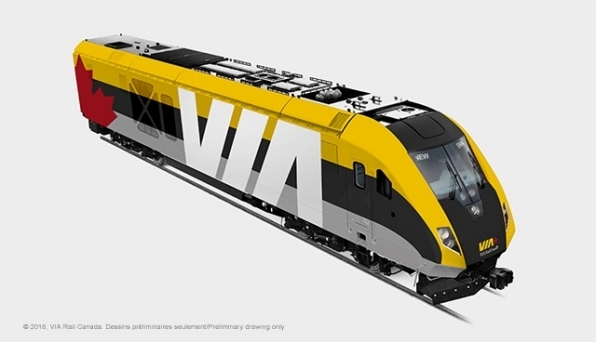 Via Rail Canada has signed a deal worth €650m with Siemens Mobility for the delivery of 32 bi-directional trainsets powered by Charger diesel locomotives. With deliveries commencing in 2021, the contract includes a service agreement for 15 years. Service area of the new trainsets will be formed by VIA's busiest route, the Quebec City – Windsor Corridor, connecting Canada's two largest cities, Toronto and Montreal, and spanning more than 2,200 kilometers in a northeast-southwest direction. Environmentally friendly with a Tier 4 emission compliant power unit, the locomotives offer a carbon emission reduction of up to 80% compared to current equipment. Additionally, the locos will be prepared.